"After 40 years supplying environmentally correct products to the automotive world, the best brick-and-mortar Auto Parts Retailers have demanded we make more Zymöl products available to everyone through them," says Charles Bennett, CEO of Zymöl. 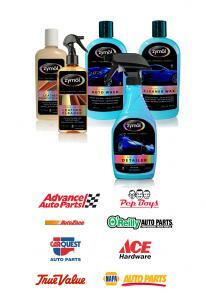 Zymöl products can be found at Advance Auto, Pep Boys, AutoZone, O’Reilly Auto, CarQuest, NAPA Auto, ACE Hardware and True Value Stores. We are changing the world’s expectations of superior results, customer care and customer satisfaction at Retail with Natural and Organically derived surface care products sought after by the owners of the most prized possessions. Our formulas are different than the standard chemical fare. They are clean, real and do more to protect paint, chrome and leather by using Carnauba, Coconut, Aloe Vera and Banana extracts. Auto Wash is a highly concentrated car wash designed to gently remove harmful contaminants that will rob a car of its protection and shine. It encapsulates and lifts road soils and film without dulling or spotting. This formula is gentle enough to use every time the car is washed. Contains concentrated soaps and a blend of Banana and Coconut extracts. Cleaner Wax is the first true cleaner and wax combination, and it does an exceptional job at both. Organic micro-polishing agents clean and repair minor paint blemishes, scratches and abrasions without petrol solvents while imparting a brilliant coat of natural waxes to protect any finish. Contains Carnauba and Bees Wax. Spray Detailer is the perfect spot clean-up for any vehicle between regular waxing. It’s fast and simple and provides "just-waxed" results. By using Coconut wetting agents and Rice Bran Wax with infused Aloe Vera, Spray Detailer provides “just-washed-and-waxed” results. Leather Cleaner gently removes tough oils and soils from new or old leather quickly and completely. Produced with Castile (Olive Oil) soap and Lanolin, this pH balanced formula safely cleans and restores the beauty to soiled automotive or home interior leather. Vitamin E rich Leather Conditioner is our waterless natural conditioner for automotive and home leather. Collagen combined with lemon seed, Aloe Vera and Coconut oils soften and protect against soiling and damage while enhancing color and leaving a soft natural warmth and glow and feel. 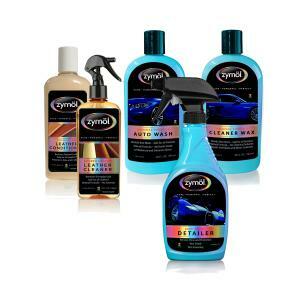 Zymöl products found at Advance Auto, Pep Boys, AutoZone, O’Reilly Auto, CarQuest, NAPA Auto, ACE Hardware and True Value Stores will be affordably priced and available to take home without waiting for shipment. As always check availability with a local store. Why You, and Only You, Should Wash Your Car by Hand.